The Disney movie adaptation of A Wrinkle in Time premieres March 9, and readers, new and returning, are likely to seek out Madeleine L'Engle's Newbery-winning novel. They'll encounter worlds of galactic fantasy and human compassion. Out in time for this renewed interest in the beloved 1962 novel is Becoming Madeleine: A Biography of the Author of A Wrinkle in Time (Farrar, 2018). Written by L'Engle's granddaughters, Charlotte Jones Voiklis and Léna Roy, it gives readers an intimate look at their "Gran." Covering the author's childhood and the years leading up to the publication of Wrinkle, this 162-page volume is rich in family photos, poems, letters, and journal entries. 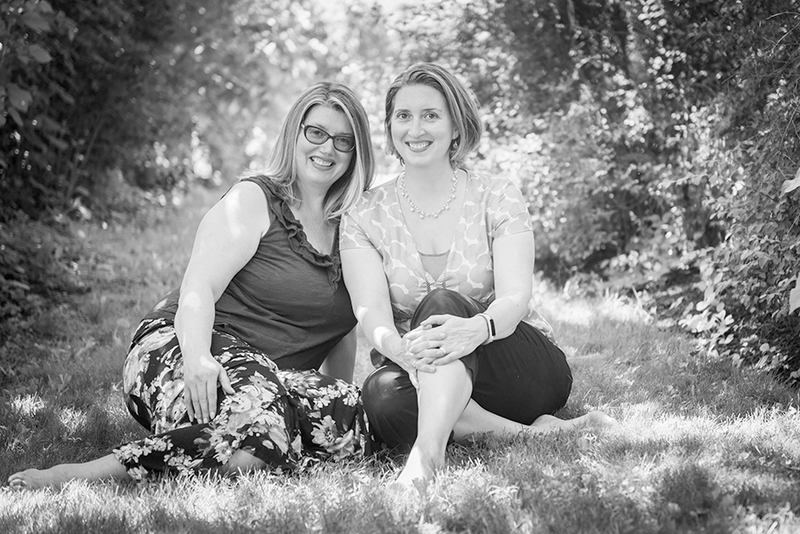 The prolific writer's only granddaughters tell the story of a girl who turned youthful solitude into universally respected fiction. I had a chance to sit down with Charlotte and Léna and ask them about the book. Below is an abridged version of our conversation. Léna Roy (left) and Charlotte Jones Voiklis (right). Photo courtesy of Macmillan. 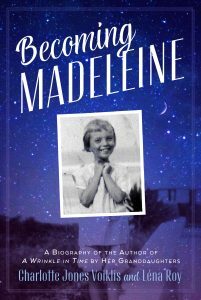 SLJ: How did the book Becoming Madeleine get started? Charlotte Jones Voiklis (CJV): We thought about a picture book version, but when it grew into a middle grade biography, my sister, Léna, was fearless as we went back and forth with drafts. At the end, it was as if we used a literary backstitch to tuck it all together. Also, in November 2018 we celebrate Gran's 100th birthday. Léna Roy (LR): It's like a love letter to her. SLJ: Becoming Madeleine is full of so many special memories. What's one of your favorites? LR: As a child, I loved snuggling up with her in her four-poster bed in Connecticut. She would make us peppermint hot chocolate, and we would read aloud the Shakespeare comedies, such as Twelfth Night. We learned about humor and how to read in iambic pentameter. CJV: She wasn't a cookie-baking grandmother. Instead, she took us to museums and the planetarium. SLJ: Writers like Neil Gaiman, Anna Quindlen, and Anne Lamott have mentioned your grandmother's writing as a major influence. What influenced her? LR: Before her father died, when she was in boarding school, she sent him all her short stories and poems. He would respond with honest criticism. CJV: I think she wanted to write and publish in part because her father was a writer. After he was affected by mustard gas in World War I, he was no longer very successful. Gran was very determined. When she graduated from Smith College and moved to New York, she wanted Eva Le Gallienne to read her play. LR: She did everything she could to meet the famous actress, including waiting at stage doors. In the end, my grandmother met this theater legend and, eventually, worked with her on Broadway. SLJ: How did your grandmother influence you? LR: Gran had a profound respect for children, which she passed on to me, and I feel as if I am carrying on in that spirit through my work with Writopia Lab. In fact, she is definitely Writopia's fairy godmother! Our mission is to foster joy, literacy, and critical thinking through creative writing to all kids and teens. CJV: After working in academia and nonprofits, I'm now managing Gran's literary estate. SLJ: Do you see your grandmother in any of the characters in A Wrinkle in Time? What do you think readers/movie viewers could take away from that character? CJV: I think she was a lot like Meg. When Gran was growing up, she often felt awkward and alone. When Meg went on a hero's journey, she did it...not to save herself but someone she loved. LR: I hope that readers will be inspired to keep becoming themselves—you never know what's going to happen! SLJ: What is your connection to the upcoming movie version? CJV: We did not have a role in the production's development, but they generously invited our families on the set as extras. SLJ: Can you talk about why A Wrinkle in Time remains relevant today? CJV: The book doesn't shy away from saying that evil exists and that it's not just somewhere else. At the same time, it also gives readers hope and shows that all of us have the capacity and responsibility to shine a light in the darkness. LR: It's a great story about overcoming external and internal obstacles and how caring for other people makes us more than who we think we are. SLJ: What is next for your grandmother's legacy? LR: Inspired by her letters and journals, I'm working on a novel about her years as a single woman in New York. The working title is The Cherry Orchard. CJV: There's a book, Intergalactic P.S. 3 (Farrar, 2018.) It was originally published in 1970 by the Children's Book Council. Now it's a chapter book that reflects A Wind in the Door, a Wrinkle sequel. For more information on Madeleine L'Engle and her granddaughters, visit madeleinelengle.com. Barbara Wysocki is a retired children's librarian from Connecticut. For more than a decade, she attended writing workshops led by the late Ms. L'Engle. Your Gran would be so proud of both of you. Barbara, thank you for the lovely article. I can’t wait to read The Cherry Orchards.